Heat the oils in a wok or broad frypan over low-medium heat. When hot, add tofu or mince and stir fry until brown (continually stirring). Add ginger, garlic, mushrooms, chili (optional), water chestnuts, spring onions, glass noodles, carrot, zucchini and mix well. Add tamari, lime juice and rice wine vinegar and stir briefly. Turn off heat and toss through coriander leaves. 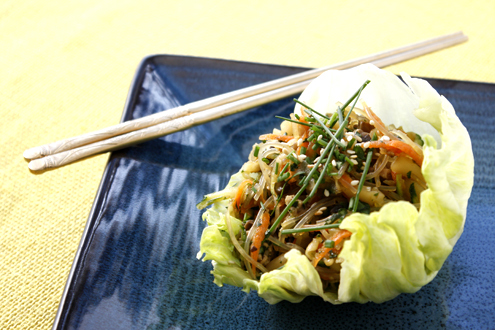 Sprinkle with toasted sesame seeds and serve either in the lettuce leaf cups or on a platter and dish up at the table. I made this recipe the other night and it received two thumbs up from my husband and my parents! I left out the noodles, water chestnuts, and coriander since I didn’t have them on hand. Still turned out delicious! The leftovers the next day were even better – so good that my husband ate it for breakfast with two eggs sunny side up!